As long-time New Yorkers we not only feel at home in lively and vibrant cities, we prefer them. And downtown Portland, Oregon, reminded us of the best of our hometown — only smaller and with more bicycles and way more waterfalls. Okay, so the waterfalls aren’t really in downtown, but they might as well be. 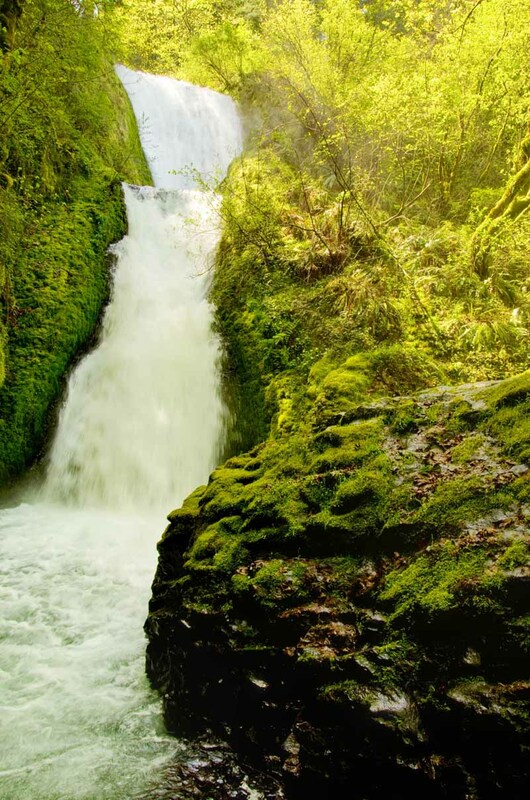 In the amount of time it takes a New York subway to travel from City Hall to the Metropolitan Museum of Art you can drive from Portland’s bustling city center to the Columbia River Gorge National Scenic Area and its more than 77 waterfalls. And getting there couldn’t be easier. A 30-minute drive east on I-84 out of Portland brings you to Exit 22 and the Historic Columbia River Highway. Drive another winding and scenic six miles north to reach your first waterfall. Unique among this area’s largest waterfalls, Latourell plunges without interruption from its full 240-foot height. The lower falls, seen here, is visible a short walk from the parking area. A two-mile round trip hike leads to another 100-foot upper falls that visitors can see from underneath if they choose. A short but steep half-mile trail takes you through the woods, along a stream, and to the base of this two-tiered, 120-foot waterfall. 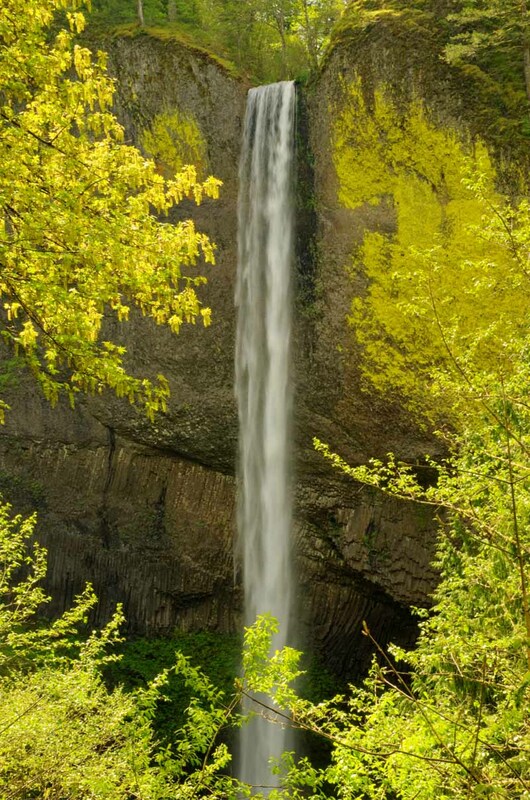 To find Bridal Veil from Latourell simply drive two miles north on Historic Columbia River Highway and look for the large signs, and often large crowds, that identify these scenic locations. From the road, Wahkeena looks to be nothing more than a trickle. Another short half-mile hike into the woods (this time climbing a couple hundred feet) leads to another fantastic double waterfall. Wahkeena is found three miles north of Bridal Veil on Historic Columbia River Highway. 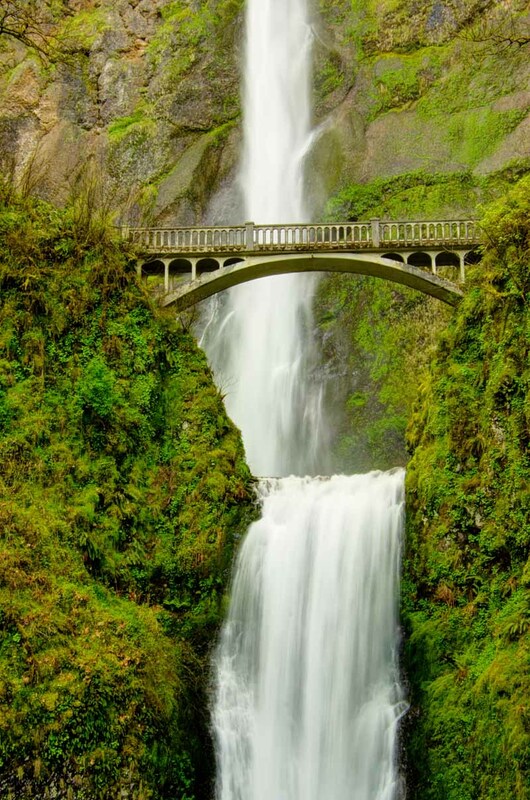 Certainly Oregon’s tallest, and arguably its most stunning, Multnomah Falls cascades 611 feet behind a single-arch stone bridge in a picture-perfect display of everything a waterfall should be. Visitors can admire its full height and magnificence from an easily accessible viewing platform at the base, or use this as a starting point for a number of hikes. The most common is the steep, switchback-laden ascent to the top of the falls, which also includes a trip across the Benson Bridge. From the top, a network of trails leads intrepid hikers to several other waterfalls. 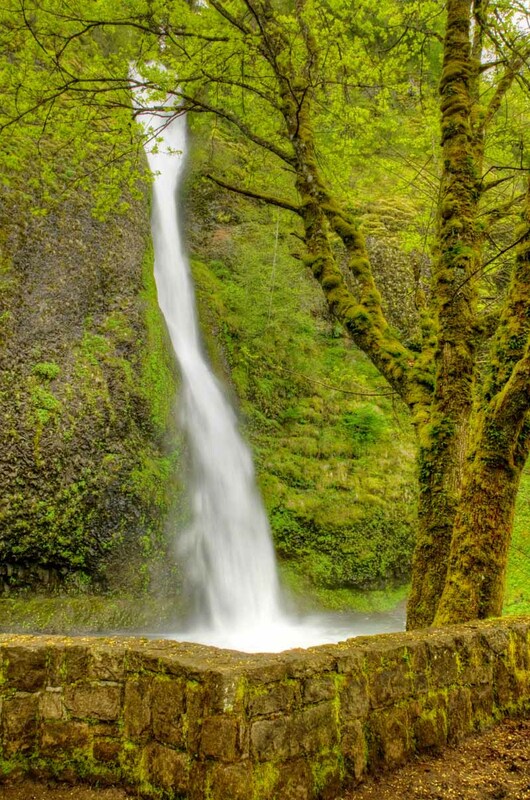 Multnomah Falls is just one mile north of Wahkeena on the Historic Columbia River Highway. Another drive-up waterfall awaits just three miles further north. 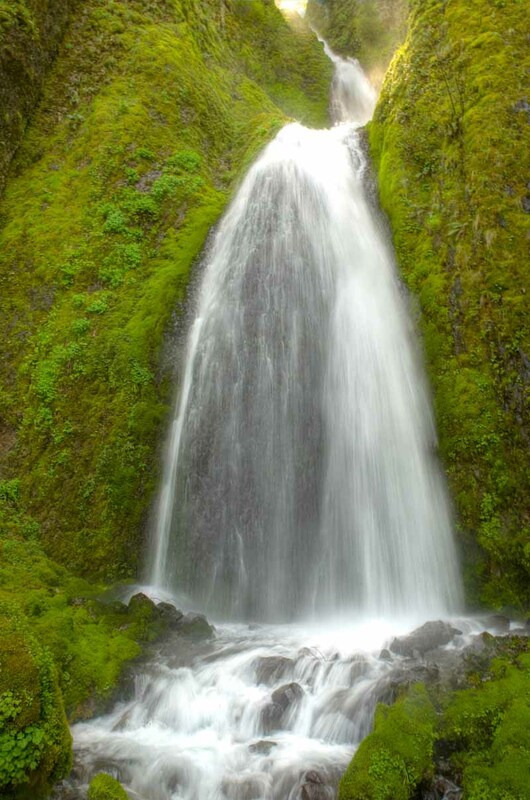 A hiking trail leads away from the road and toward more waterfalls, including Upper Horsetail and Oneonta. Wow!!! I love waterfalls. Last year I visited Watkins Glen State Park, there are 17 falls there. Now I’m going to have to road trip to Oregon!!! Watkins Glen is a very special place . . . maybe one of our favorites in New York. Sorry about that, but you have a pretty great home town. Lots to miss, for sure. Beautiful photos. I have only visited a couple of them. Looks like a trip to Portland is in order. Wow!. Love waterfalls. Great photos. Might need to visit Portland. Nice picture…i am far..far away from their…but surely u made me think to visit their. Wow, stunning. I have always wanted to go to Portland so I will definitely be referring back to this post when I do! We’ll have some more to say on the city so stay tuned for that too. We were just there a few weeks ago and it’s really incredible these waterfalls are so accessible. 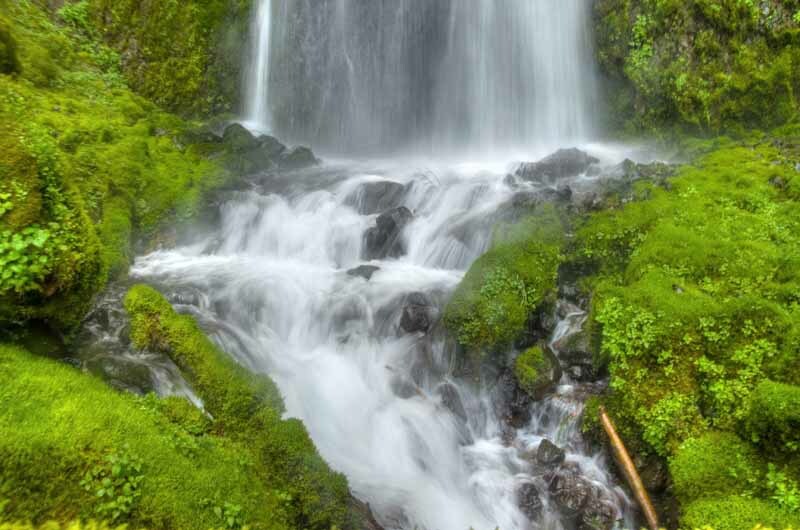 In most places, you usually have to go to the mountains and take a hike to see a waterfall. Great photos! We were saying the same thing. Normally we’ll go out on some arduous hike to see one scraggly little waterfall and call it a victory. Here you practically drive right up to tons of great ones. It’s crazy. Well thank you for following along. I got married at Bridal Veil. So beautiful… the whole area! Cool place for a ceremony. East – West Two different knids of beuty and so much more inbetween. What a country! Glad that I am here. loved the info & pics. I’ll have to visit the other falls on my next trip. Was just there early June & explored around Multnomah Falls. So Beautiful and Relaxing! You can see my review on my blog. thxs. Gorgeous photos! We’re headed back to Oregon next summer . . . putting these beauties on our “must see” list! Salud!! They are all breathtaking, but Multnomah Falls is insanely beautiful! Multnomah Falls in the winter were absolutely striking. Can’t image how they must be in the summer… wait, I can! You brought them to me. At the east end of the Gorge, two hours from the waterfalls pictured above, you’ll be hard pressed to find any rushing falls…too dry. Striking basalt rock ledges, buff-colored hills baking in the 90+degree weather with the wide river cutting its way through. That’s what’s so great about Oregon: foggy beach to high desert in 5-6 hours flat! Just drove back through the Gorge from a week-end of winetasting, north in Walla Walla, WA. That’s a fun thing to do. Beautiful rolling hills surround this small eastern Washington town with wheat, corn and now vineyards, turning this historical agricultural mecca into Vinotopia! I love Oregon and the Columbia River Gorge is one of my favorite place in the world! Those waterfalls are gorgeous. Beautiful. I wish we will have time to visit Portland on my next visit to the States.